Commercial radio remains the most complex medium in the country. Radio stations range from small-town radio, daytime-only outlets with a broadcast range of a few miles, to huge 100,000 (ERP) watt radio stations that send signals across several states. The multiplicity of programming formats, sales outlets, power capabilities, and network arrangements add to the difficulty of mastering the radio field. The sheer number of radio stations also poses difficulties. Over 10,000 commercial radio stations currently broadcast in this country. Despite their numbers, radio stations can be hard to locate. Unlike television stations, radio stations often have transmitters that are located outside major population centers, and are therefore not included in major radio markets. In fact, only about half of U.S. radio stations fall into Nielsen-defined Metro Survey Area radio markets. We at PrecisionTrak have developed a comprehensive approach to organizing radio. The website contains every radio station in the United States. Those radio stations measured by Nielsen Audio are listed within one of the current Metro Survey Area markets. 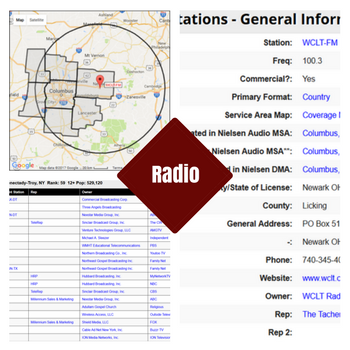 Those radio stations located outside MSAs are found within Nielsen Designated Market Areas. Users have the option of looking up either Nielsen MSAs or Nielsen DMAs or using the interactive maps to access to all U.S. radio stations. Please contact us in order to learn more about the benefits of having access to our Radio data and reporting engines.